It was not the snow, the wonderful, powdery snow of Christmas Eve and Christmas Day. It was the kind of snow that Hollywood created at the end of the movie "White Christmas". It was the kind of snow Irving Berlin wrote the song "(I'm Dreaming of a) White Christmas" about. It was not my friends. One of them blessed me a hundred times over with a gift that has left me humbled beyond words. It was not the neighbor who came over and blew out the driveway apron even after he'd put his snowblower away on Sunday. I would have shoveled the apron. I would have gone slowly and it would have been cleared. But it took 10 minutes instead of 45, which meant my whole morning wasn't spent shoveling snow. It was not the two members of my World of Warcraft guild, Amber and Bill, who spent real money to get me in-game items that have no real value other than they are cool. Likewise, I do not hate the son-in-law who spent real money to get me in-game items that I am going to have incredible fun with. I do not hate the daughter who called late on Christmas Eve and talked to me into Christmas morning (technically) because "calling mom on Christmas is important". Yes, I was still up anyway. I do not hate being alone on Christmas. There is a time and a place for the hectic life of holiday rushing. I have reached the age where being alone is just as good as being with my family although I really would have liked to have seen Brett and Blake's face when my mother handed them a gift they were not expecting. While it may sound weird, there is great comfort in the quiet and being with the cats, reading the newspapers I didn't get to and having a big, black cat complaining that not enough ear scratching was going on. What I hate about Christmas was BOTH living room lights burning out in the evening, one after the other. They are 3-way lights and of course I don't have extra of those bulbs. So, at lunch, I head over to the grocery to get new bulbs. I am presented with a dizzying array of choices in light bulbs. 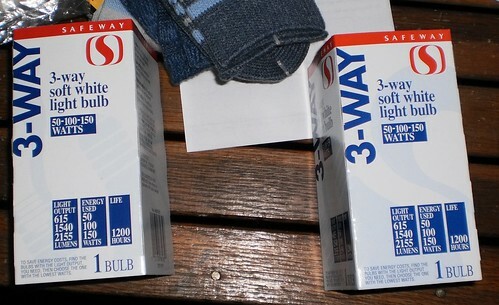 None of the compact fluorescent or the "long-life" seems to work in a 3-way lamp. I am forced to buy conventional bulbs. At least they were inexpensive. I came home and replaced the bulbs. We now have lights in the living room. When you live with a black cat, no lights in the living room is NOT a good thing. There are CF 3 ways but we had to get them at a regular hardware store.